The Freedom Golf Program to get our veterans ACTIVE. Contact our Golf Program Chairman for all your golf ideas, suggestions and sponsorship. The AFF owns two adaptive golf carts for use by Veterans needing them. Adaptive Golf Carts are located at The Greens at North Hills and Cypress Creek in Cabot. We also have some great courses to play that are Veteran friendly and you are always welcome. Tell them you are an AFF Member. Contact Mickey Spillane if you are a centarl Arkansas Golfer and want to get in hois small group. Golf outings and camaraderie to enjoy golf. Contact any of the courses below for tee Times. 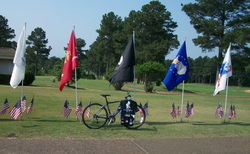 Golf Fundraisers are fundamentally a sound choice to help us raise money for our Arkansas Veterans. They are fun and help us achieve our mission of rehabilitative sporting events. The Arkansas Freedom Golf Scramble - Has been at Diamante CC in Hot Springs Village for the past 9 Years. Diamante has been a great host and we are thankful for their support. The 9-11 Red White and Blue Scramble. Jack and Mark Ramer and Aardvark Radio have done this event at Rebsamen Golf Course in Little Rock. A great time for golf. We certainly thanks these guys for putting a class event. Currently looking for new organizers. The 100 Holes of Golf, Golf -A-Thon. Held at Cypress Creek in Cabot, you get sponsors to donate a per hole amount. Then you go Golf. Up to 100 holes. This event can be done at home courses around the state. Click here to register or support the Freedom Scramble. You can donate to our Golf Program easily through Pay Pal. Just click this button.